The mission of The Friends of the Pasadena Public Library is to support the library’s programs, special services and cultural events. Priority is given to projects that instill the excitement of discovery and the love of reading in library patrons of all ages. 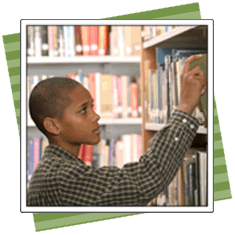 Our organization helps fund critical library programs ranging from summer reading clubs for children and teens, to community-wide One City, One Story events. Want to help? Become a member of The Friends by making an annual membership donation. Donate online or pick up The Friends’ membership brochure at Central Library or your local branch library. Funding is raised through membership fees and donations as well as book sales at Central Library. Please consider an online donation or become a member today! Support our public library programs as you shop. Designate The Friends of the Pasadena Public Library as the charity you wish to benefit. At Vroman’s independent bookstores, a portion of your in-store purchases will be returned to The Friends. Enroll in the “Gives Back” program online at https://www.vromansbookstore.com or at a store register. For online shopping, use Smile.Amazon.com, which offers the same products and prices as Amazon.com. The AmazonSmile Foundation donates 0.5% of the purchase price to our non-profit. Enroll at https://smile.amazon.com. Need groceries? Stop at Ralphs, which recently added The Friends to its Community Contribution Program. Enroll at www.ralphs.com and use our account I.D. number (BX460) to designate The Friends of the Pasadena Public Library as your favored non-profit. Our organization is grateful for skills and public support provided by individuals, local businesses and non-profits. Jericho Road Pasadena is a Special Supporter. Visit JRPasadena.org. Receive email reminders about our book sales and learn about our latest events!